… and decided to turn it into a n o – s e w f a b r i c b a n n e r you can D I Y .
the project took about 15 minutes with 30 minutes of drying time. S U P P L I E S : you’ll need a fat-quarter of our design on spoonflower here (or get a yard and make 4), fabric glue, no-frey fabric sealant, small dowel, a q-tip, and twine or ribbon for hanging. 1. cut the banner from the fat quarter of fabric and iron if needed. 2. follow the directions on the no-fray sealant and let dry. meanwhile cut the dowel a little wider than the banner (i used a steak knife…. prob not the best, but is worked!). 3. turn the banner face down and lay the dowel on top about an inch from the top. then squeeze a line of fabric glue an inch below that, smear with a q-tip and fold the fabric down over the dowel, leaving a little wiggle room. press down along the glue and let dry. 4. then, all that’s left is to cut and tie twine to each end of the dowel…. 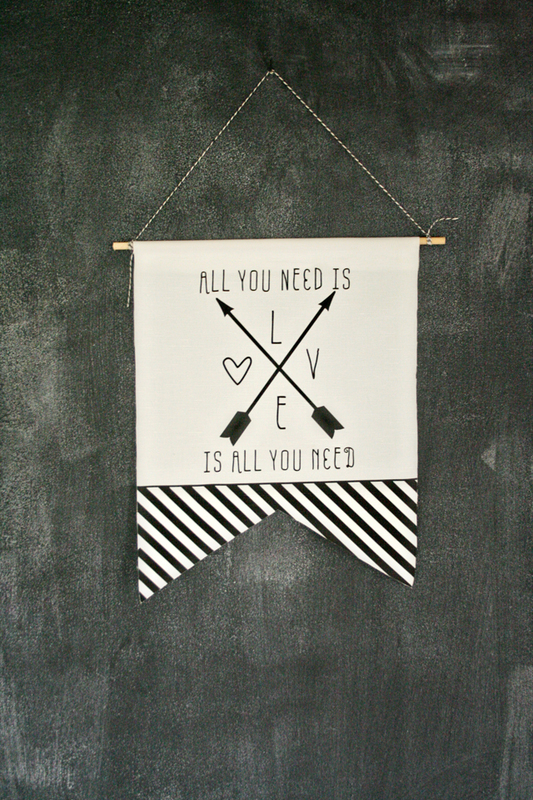 … and find the perfect place to hang it! if you like the banner idea, or want to see more designs or maybe a template to make your own design or use with a patterned fabric, let us know in the comments! A lovely idea for a DIY Valentine! Love it. Great project! I am thinking about doing something very similar. I’d love to see a tutorial on how to use spoonflower to make a banner like this.